South Sudan (/suːˈdɑːn, -ˈdæn/ ( listen)), officially known as the Republic of South Sudan, is a landlocked country in East-Central Africa. The country gained its independence from the Republic of the Sudan in 2011, making it the newest country with widespread recognition. Its capital and largest city is Juba. South Sudan is bordered by Sudan to the north, Ethiopia to the east, Kenya to the southeast, Uganda to the south, the Democratic Republic of the Congo to the southwest and the Central African Republic to the west. It includes the vast swamp region of the Sudd, formed by the White Nile and known locally as the Bahr al Jabal, meaning "Mountain Sea". Sudan was occupied by Egypt under the Muhammad Ali dynasty and was governed as an Anglo-Egyptian condominium until Sudanese independence in 1956. 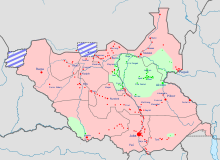 Following the First Sudanese Civil War, the Southern Sudan Autonomous Region was formed in 1972 and lasted until 1983. A second Sudanese civil war soon broke out, ending in 2005 with the Comprehensive Peace Agreement. Later that year, southern autonomy was restored when an Autonomous Government of Southern Sudan was formed. South Sudan became an independent state on 9 July 2011, following 98.83% support for independence in a January 2011 referendum. The Transitional Constitution of the Republic of South Sudan, 2011 was drafted by a Southern Sudan Constitutional Drafting Committee. It was published in April 2011. Ethnic violence in South Sudan has a long history among South Sudan's varied ethnic groups. South Sudan has 64 tribes with the largest being the Dinkas, who constitute about 35% of the population and predominate in government. The second largest are the Nuers. Conflict is often aggravated among nomadic groups over the issue of cattle and grazing land and is part of the wider Sudanese nomadic conflicts. This is a list of streams and rivers in South Sudan, arranged geographically by drainage basin. There is an alphabetic list at the end of this article. The list may not be comprehensive. Prostitution in South Sudan is legal but related activities such as soliciting or brothel-keeping are illegal. Corruption in South Sudan is among the worst in the world. The nation's elites have developed a kleptocratic system that controls every part of the South Sudanese economy. This system has taken shape quickly in a relatively short period, South Sudan having won self-rule in 2005 while remaining part of Sudan, and having been accorded full sovereignty in 2011. The nation was ranked fifth on Transparency International's 2014 list of most corrupt nations, preceded only by Somalia, North Korea, Sudan, and Afghanistan. The Sudan People's Liberation Army (SPLA) is the army of the Republic of South Sudan. The SPLA was founded as a guerrilla movement against the government of Sudan in 1983 and was a key participant of the Second Sudanese Civil War. Throughout the war, it was led by John Garang. The Comprehensive Peace Agreement (CPA, Arabic: اتفاقية السلام الشامل‎, Ittifāqiyyah al-salām al-šāmil), also known as the Naivasha Agreement, was an accord signed on January 9, 2005, by the Sudan People's Liberation Movement (SPLM) and the Government of Sudan. The CPA was meant to end the Second Sudanese Civil War, develop democratic governance countrywide, and share oil revenues. It also set a timetable for a Southern Sudanese independence referendum. The Judiciary of Southern Sudan, or JOSS, is a constitutionally mandated government branch that oversees the court systems of South Sudan. The Chief Justice of the Supreme Court of South Sudan is the head of the judiciary, and is held accountable to his job by the President of South Sudan. The Media of South Sudan is underdeveloped compared to many other countries, including fellow East African states like Kenya, Tanzania, and Uganda. Poor transportation infrastructure and entrenched poverty in the country inhibit both the circulation of newspapers, particularly in states located far from the capital of Juba, and the ability of media outlets to maintain regular coverage of the entire country. Elections in South Sudan refer to the electoral process and the elections in South Sudan. January 2017 map with phase classifications from "minimal" to "famine"
The South Sudanese Civil War is an ongoing conflict in South Sudan between forces of the government and opposition forces. In December 2013, President Kiir accused his former deputy Riek Machar and ten others of attempting a coup d'état. Machar denied trying to start a coup and fled to lead the SPLM – in opposition (SPLM-IO). Fighting broke out between the Sudan People's Liberation Movement (SPLM) and SPLM-IO, igniting the civil war. Ugandan troops were deployed to fight alongside the South Sudanese government. The United Nations has peacekeepers in the country as part of the United Nations Mission in South Sudan (UNMISS). In January 2014 the first ceasefire agreement was reached. Fighting continued and would be followed by several more ceasefire agreements. Negotiations were mediated by "IGAD +" (which includes the eight regional nations called the Intergovernmental Authority on Development as well as the African Union, United Nations, China, the EU, USA, UK and Norway). A peace agreement known as the "Compromise Peace Agreement" was signed in August 2015. Machar returned to Juba in 2016 and was appointed vice president. Following a second breakout of fighting within Juba, the SPLM-IO fled to the surrounding and previously peaceful Equatoria region. Kiir replaced Machar as First Vice President with Taban Deng Gai, splitting the opposition, and rebel in-fighting has become of major part of the conflict. Rivalry among Dinka factions led by the President and Paul Malong Awan have also led to fighting. In August 2018, another power sharing agreement came into effect. Water supply in Southern Sudan is faced with numerous challenges. Although the White Nile runs through the country, water is scarce during the dry season in areas that are not located on the river. The post conflict South Sudan has huge challenges in delivering health care to the population. The challenges include: crippled health infrastructures, nearly collapsed public health system, and inadequate qualified health professionals. The country is far from achieving the MDGs by end of 2015. The health system needs a major resuscitation, in addition to supporting and developing health training institutions. The States of South Sudan were created out of the three historic former provinces (and contemporary regions) of Bahr el Ghazal (northwest), Equatoria (southern), and Greater Upper Nile (northeast). The 32 states are further divided into 180 counties. ... that one member of South Sudan's delegation to the 2016 Summer Olympics was informed by email eight days prior to the Games that he would not be competing? ... that the South Sudan National Cup has been won more times by Al-Malakia FC than by any other team? ... that Suzanne Jambo helped draft the Constitution of South Sudan? ... that despite being shot in the back and witnessing atrocities as a child soldier in South Sudan, Deng Adut is now a defence lawyer in Australia? ... that deserters from the South Sudanese army embarked on a long march north, across the border into Sudan, to escape their former comrades? Do you have a question about South Sudan that you can't find the answer to? For editor resources and to collaborate with other editors on improving Wikipedia's South Sudan-related articles, see WikiProject South Sudan. Salva Kiir Mayardit, the first President of South Sudan. His trademark hat, a Stetson, was a gift from United States President George W. Bush. South Sudan map of Köppen climate classification. This CIA map uses the provincial borders that existed at the time Sudan gained independence in 1956. In 1960, small sections were transferred to northerly provinces. The Comprehensive Peace Agreement of 2005 ending the second Sudanese civil war provided that the border between southern and northern Sudan would be restored to its 1956 state. This page was last edited on 7 February 2019, at 20:46 (UTC).